I often go on "typewriter safaris" but have never documented one. So today I took a camera so I could show you everything I got to see. Later style (late 30s to early 40s) LC Smith Super Speed missing the top cover for either $45 or $545, either way not a great deal. I love these machines but already have one and wouldn't pay much for one with no top. Royal KMG, early 50s for $95 with the stand. I do not know what stands are worth but this was too much for me even though I love these machines. Besides, I have two in my home already. Tower Tabulator probably 1950s for only $20 at a Goodwill. This is the one with the "atomic logo" and was easily one to take home. I like these machines and it is a little redundant in my collection so I am likely to resell or trade it after I play with it a bit. Excellent working shape and so so cosmetic shape. Marked down to $20 from $35. I am not interested in toy typewriters but I figured I'd get a picture. Royal Junior depression machine with a rock hard platen and cracked platen knob. At $59 this was tempting but easy to walk away from given that I do not need more projects and prefer a usable machine to a more rare one. This would require some more money to become usable. Olympia SM3 for $125. This was the only machine behind glass and it did look perfect, even had a manual. For the right person this is a good price but I am not he and I already have one I bought for WAY way less. Smith Corona Electra XT at Goodwill for $8. I actually sort of like these and if I didn't already have one I might have gotten it. These can be a challenging resell and I wouldn't get a lot more so I left it. The one in my collection was a little more at $10 but is in absolutely perfect shape. Marked down to $45 from $90 this wide carriage Underwood has been at this consignment shop for over a year and needs a lot of TLC. I don't really like wide carriage machines anyway. Smith Corona Coronet Super 12 with the Coronamatic cartridge marked down from $27 to $13 and with an additional 20% off. That's less than the cartridge costs but I already have one AND an extra one... these machines are sweet though and at that price are a good move for anyone who doesn't have one. Only store that seemed sketch enough to leave my camera in the car; this is a cell phone photo. Even though this shop was in a slightly sketch part of town they were asking $500 for this broken LC Smith! Earlier Smith Corona 6 series electric for $50 which is pretty ridiculous in my mind. This machine has been at this store several months. Remington All-New or early Quiet Riter for only $45 in very good shape. This is a good deal, but not a good enough deal. If it's still there after being marked down someday... we'll see. 50s Underwood with excellent touch for just $35. I don't need another standard right now and I don't want to try and sell it but if someone local wants a good reliable machine I know where to get one. I saw this machine last time I was at this store and was surprised it hadn't moved. Really nice Remington Quiet Riter for $38. I almost got this but it was right on the threshold and I walked away. Definitely gets my endorsement for someone looking for that one rugged typewriter to do some writing with. Very sad Royal HH which has been in this store forever and is in terrible shape. At $40 it will probably remain there for a long time into the future. 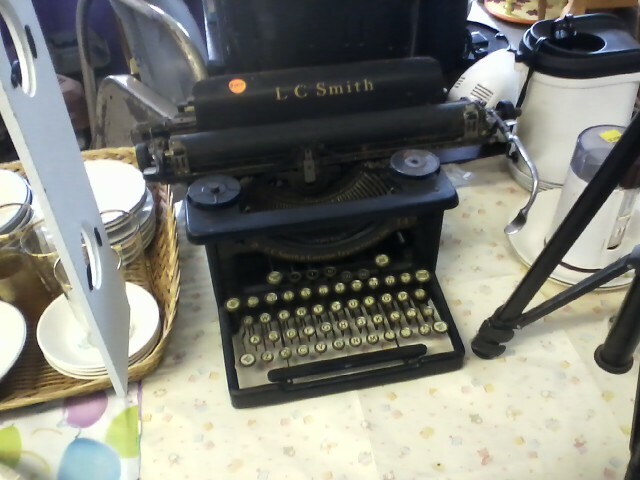 Good typewriter hunting, but the prices, except for the Tower, are way too high. I got my SM3 for about a tenth of that price. Around here all I see is an electric every few months or a few wedges. Good selection, ridiculous pricing. I've seen antique stores ask just as much for broken machines. There's a local place with a Royal KHM, 24" carriage, asking $150. It's been there for well over two years now. Still, the HH doesn't look TOO bad. Am I missing something? Everything on it is either stuck or loose, it just feels so worn, and the rubber is bad. It would be a good buy at $10. Great excursion. You live in a rich land. Love your notes on the prices and how the Olympia is the only one that might be worth its high ask. See the entry and comments in the Typewriter Database at - http://typewriterdatabase.com/1956-tower-tabulator.5216.typewriter - for observations on that Tower "Atomic" logo. I don't share your opinion of the Electra XT; based on experience with several examples, they are quite flimsy and touchy. But do you know they have a single, not-obvious Change-A-Type key? It's on the 1/4 / 1/2 key but I have never seen a Change-A-Type kit with the proper keycap for this design. The slugs work, though. And what does "sketch" mean? Sketch is short of sketchy. And I might just love my XT because it really is in perfect shape. Could be they don't stand up to use. Fun! My judgments on these typewriters would be very similar to yours. I am guessing you also would have snagged the Tower? It's a surprisingly nice machine. I love the tabs behind the flip down piece on the back of the carriage. I have had a few Smith 5s like that but the one I have retained in the collection is a Silent Super with the fancier tabs.